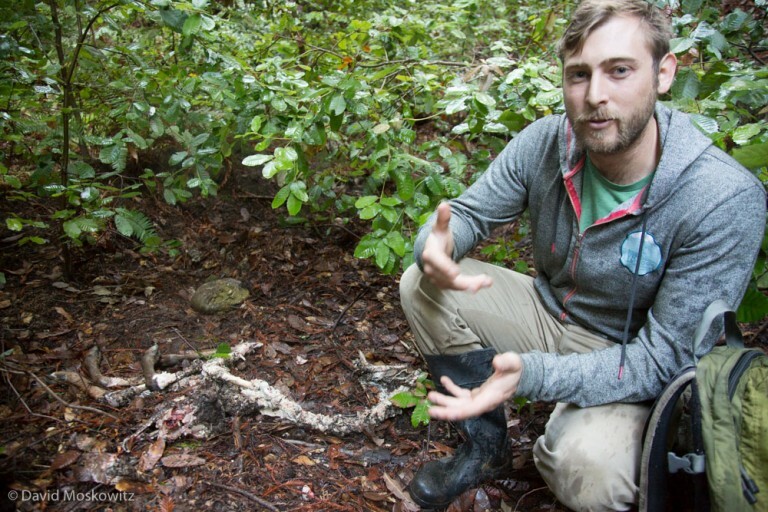 In February I had the opportunity to spend a couple of weeks in the field with the Santa Cruz Puma Project, an ongoing research program based out of University of California Santa Cruz. Along with learning about the general biology and ecology of mountain lions, researchers and graduate students are looking specifically at how these large cats interact with human populations, neighborhoods, and roads. The San Francisco Bay area is one of the largest metropolitan areas in the United States but still includes a matrix of open spaces and wild lands that mountain lions have managed to carve out an existence in. The primary study area for the project is the Santa Cruz mountains which run south from San Francisco. Plant communities range from redwood forests to arid chaparral and oak woodlands. On the eastern edge of the Santa Cruz mountains, residential areas intermix with parklands and forested mountains creating a fragmented landscape that mountain lions travel through carefully. In order to get detailed information on the movements of mountain lions, the project live captures mountain lions and attaches a GPS collar to them. Hounds are used to track the cat which typically climb a tree to evade the dogs. Researchers can anesthetize the mountain lion, give it a physical exam and secure a radio collar to the cat. Here roundsman Dan Tichenor has just released one of his hounds on the fresh trail of a mountain lion. Treed mountain lion in a Pacific madrone tree. Besides a GPS unit, the collars also include a radio signal transmitter which researchers can use to get close enough to the cat to wirelessly download data from the collar. Other collars have a transmitter which allows GPS data to be transmitted via cell service. All of the lions in the project with these collars are currently on a family plan I was told (seriously!). Here wildlife biologist Paul Houghtaling is attempting to locate a collared cat in a large stand of redwood trees. Once the data has been collected from the collar’s the detailed geographic information collected can be used to address a wide variety of research questions. One big question that the project is studying is about the diet of mountain lions and specifically where on the landscape they are hunting in relationship to various habitat types and levels of human presence on the landscape. Here field technician Chris Fust has used information from a collared cat to discover the remains of a deer killed by the mountain lion. Another topic of great interest to the project and numerous other conservationists in the area are the effects of roads and highways on mountain lions ability to move around the region. I spent a day out in the field with Tanya Diamond (pictured here) and Ahiga Snyder from Pathways For Wildlife whom are studying wildlife crossings of numerous roads in the region. Researcher Ahiga Snyder servicing a remote camera at a break in a fence adjacent to Highway 1 which wildlife have been using to access the roadway. Sunset over the Pacific Ocean from Wilder State Park just north of Santa Cruz California. Stunning natural beauty has drawn hundreds of thousands of people to the San Francisco Bay area for decades creating the current challenges the region is facing to conserve local wild lands and wildlife but also a human population deeply invested in the outcome.